High Tea is a quintessentially English tradition, introduced by Anna, the seventh Duchess of Bedford, to maintain one’s aristocratic blood sugar levels between an early luncheon and dinner served late into the evening. The tradition caught on rapidly, developed with the Earl of Sandwich’s then-revolutionary idea to place fillings between slices of bread, and is now firmly entrenched in the country’s culinary identity. Travel anywhere in England and you’re sure to find somewhere at which to take a high tea. Slight regional variations cast welcome individuality across teas throughout the land, from Land’s End to Newcastle-upon-Tyne, although I’m fairly certain that the afternoon tea currently en vogue at Le Méridien Piccadilly is peerless for its particular take on the conventional. The infusion is served in a clear glass tonic reduction teapot, with a small glass jug of tonic water with which to adjust the G n Tea to the desired strength. Naturally, to try all six of the suggested brews might leave one somewhat wobbly on one’s pins, so we restricted our intake to just a couple. The lavender-flavoured Monkey 47 Gin surprised me with the strength of its aroma – so much so that I didn’t feel the need to drink it, but I did have a few sips of the cucumber-infused Hendrick’s gin. This was a curiously warm yet cooling combination. On another occasion I’d be tempted to swig the lot. Alas, the day was not yet over by a long shot so it was time to exercise restraint. Next stop? The pool in Le Méridien’s basement for a preprandial dip. The G&T Afternoon Tea at Le Méridien Piccadilly is served in The Terrace Grill and Bar from 12pm to 6pm. Cost: £32.00 per person. The Terrace Afternoon Tea – served with finger sandwiches, scones, pastries and your choice from the extensive selection of teas and coffees. £25.00 per person. The Light Afternoon Tea – served with finger sandwiches and scones and your choice of tea or coffee. £18.00 per person. 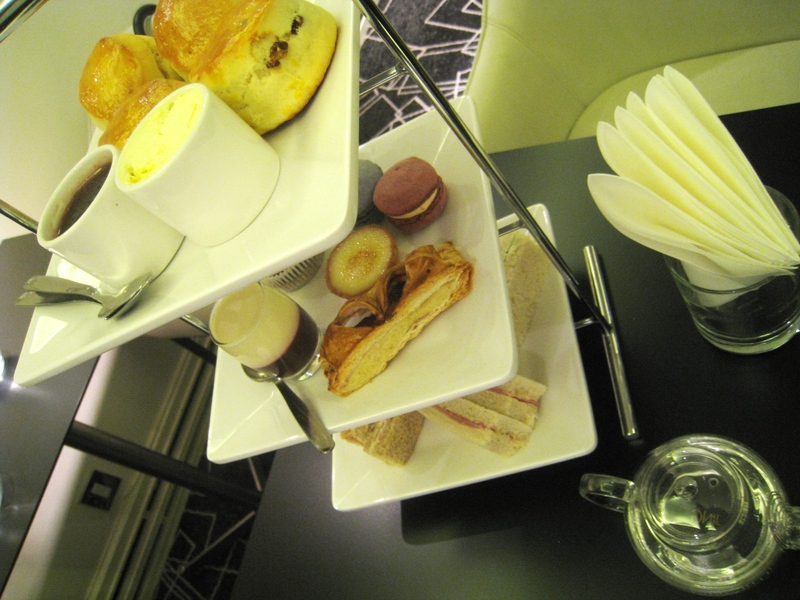 The Champagne Afternoon Tea – served with a flute of champagne, finger sandwiches, scones and pastries, tea or coffee. £35.00 per person.